BIO ~ Forest is a neutered male high-content wolf-dog. He looks and acts like a wolf but has a bit of dog in his background. He was born in May of 2006. PERSONALITY ~ Forest is a very social boy and loves to meet people. He usually has a big, goofy smile on his face, and he often helps out with our educational outreach events. However, like all high-content wolf-dogs, he retains his wild spirit. If he doesn’t want to do something, he will let us know. RELATIONSHIP ~ Forest is a high-content wolf-dog, but lives with two Arctic wolves, Alice and Thunder, who are siblings. These three first met as puppies and have known each other most of their lives. Alice and Forest are very close. LIKES ~ Forest loves to meet people, go out for walks, and greet our tour guests when they stop by his habitat. He loves the treats he gets during tours, too! Since his habitat-mates, Alice and Thunder, are rarely interested in tours, he gets all the goodies and attention without competition. DISLIKES ~ Forest does not like to ride in the van. He enjoys helping with our educational events, but he does not travel with us because of his dislike of the van. We never ask him to do things he doesn’t want to do. FUN FACTS ~ Forest the wolf-dog got his name when our former Assistant Director, Angel, met a young man named Forest who had come for a tour. He loved wolves and was so happy to share all the facts he had learned. Years later, Angel named her son Forest, too, in honor of the wolf-dog she loves so dearly. WISH LIST ~ Like of our senior rescues, we give Forest the joint supplement, Microlactin. We have it ready to order on our AmazonSmile wish list. Thank you for your help! Forest Is Close to Finding All Sponsors! 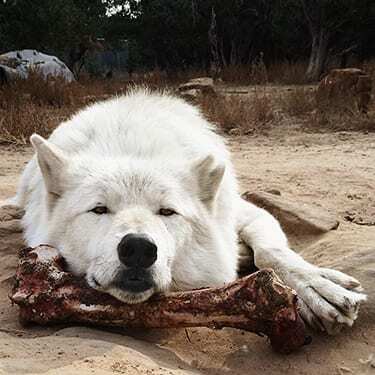 FOREST’S HISTORY ~ In 2006, shortly after we rescued the litter of Arctic wolf pups (Storm, Sugar, Powder, Alice, Thunder, and Sabine), a friend of Wild Spirit called to see if we were interested in more puppies. A litter of 8 Arctic-Timber crosses had been born in Oregon to a man who did not know what to do with them. We explained that we really had our hands full already and wouldn’t be able to take them. However, a former staff member who was planning to open a sanctuary in Ohio was eager to take the Artic-Timber litter. Out of the 8 pups in the litter, 3 were sold to private owners and the other 5 were brought to Wild Spirit for temporary housing while their rescuer made arrangements to come pick them up. Unfortunately, his plans to open a sanctuary fell through, and Wild Spirit ended up keeping the 5 puppies: 3 boys and 2 girls, named Forest, Dakota, Brutus, Savannah, and Sassy. Since they were only a week apart in age from our Arctic puppies, we put them together and let them grow up as one big family. Forest became very close with Alice and Thunder and these three have become known as our Forest Pack. Alice and Forest are very close, but Thunder and Forest occasionally have disagreements over food and enrichment treats. Fortunately, there haven’t been any serious conflicts, but like with all of our groups, we keep close watch for any sign of a problem. In general, Forest and his pack-mates are very happy with their life together.